Bank of America is currently using blockchain-based Smart Contract platform to innovate its financial transaction process. This platform allows participants to safely access and share documents and use Smart Contracts. Mizuho Bank from Japan develops digital currency-based settlement payment system. Resona Bank, Sumishin SBI Internet Bank, and Suruga Bank from Japan are also planning to start their wire transfer services based on blockchain technologies starting from this fall. These services have low wire transfer fees and allow customers to wire transfer money any time of a day. One can wire transfer by inputting cellphone number of a person who is receiving wire transfer instead of an account number and also wire transfer by using a QRD code that is shown on a Smartphone whenever making Dutch pay at a restaurant. Besides these 3 banks, 61 financial organizations also co-develop wire transfer services based on blockchain technologies. It is expected that there will be more financial organizations that will introduce such services and that they will also provide foreign wire transfer services in the future. South Korean banks and stock firms are also working on developing blockchain certification platforms together. Financial companies are facing difficulties due to increased cost of IT maintenance within low interest and low profit structure. Blockchain will be used as a catalyst to enhance financial services and to innovate IT costs. About 15% of entire IT costs can be reduced by using blockchain platforms. They allow financial companies to be free from complicated structures and closed platforms and create consistent and open platforms. Financial industry was the industry where blockchain was applied for the first time. Many FinTech companies are currently working on businesses that directly connect financial consumers and suppliers by using blockchain technologies. Many financial companies are also working on development of various services based on blockchain. Certification and verification processes of financial transactions can be simplified through blockchain technologies. Blockchain technologies reduce roles of agencies and time that is consumed for settlements and payments. Every breakdown from initial transactions is recorded and shared. Blockchain technologies prevent illegal transactions ahead of time. They make real-time international wire transfer and exchange possible, and many new payment systems based on blockchain are making their appearances. They also allow financial companies to establish automated processing systems through development of personalized products and Smart Contracts by increasing amount of data analysis. Chance of using blockchain technologies is very high within financial industries as they can simplify operation procedures, prevent illegal transactions, improve liquidity and effectiveness of capital, reduce timing of settlements and payments, and improve effectiveness of regulations. Actually, many financial companies are working on formation of consortiums and standardization fast to grab upper hands in blockchain platforms. About 50 global banks such as Citi, Morgan Stanley, Bank of America, Deutche Bank, and Goldman Sachs are participating in R3CEV Consortium and they started developing financial transaction systems, which are applied with blockchain technologies, for 8 smaller areas such as payment, transaction, company stock, and insurance. Experts are seeing blockchain as an important technology that will change current financial systems. They are expecting that distributed ledger method and collaborative value chain method will become momentums that will be needed for Industry 4.0. South Korean financial companies are also hurrying to apply blockchain technologies to their platforms. Financial investment industry is the first one to work on establishment of industrial blockchain. 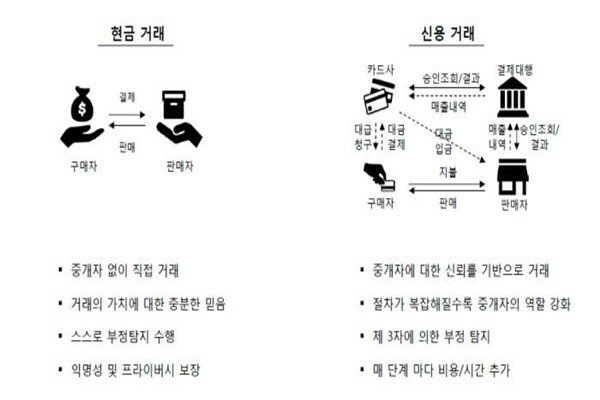 Korea Financial Investment Association recently started demonstration of blockchain-based financial investment industry’s co-certification service called ‘CHAIN ID’. This allows one to perform stock trading at a stock firm immediately whenever he or she goes through a certification procedure from a different stock firm. Even certificates that need to be renewed every year can be renewed only once every 3 years. This is the first time when blockchain technologies are utilized for certification services by stock firms. This service was developed by a consortium, which is composed of 26 financial investment companies and 5 technical service providers. It is expected that this service will be expanded to HTS (Home Trading System) and WTS (Web Trading System). Association is planning to have every stock firms participate in this service by end of this year and link this service to other financial industries such as bank, insurance, and credit card in 2019. South Korean banks also started to make moves. With The Korea Federation of Banks at the center, actual contract for blockchain certification business that has 18 banks participating was signed off. These banks are currently focused on developing relevant platforms. They will be able to share PKI (Public Key Infrastructure) information between without control centers by applying blockchain and certification technologies. They will also be able to process certification process on their own. Performance of certification systems will be improved drastically depending on number of established servers. Even if there is an error with a bank, it will not have an effect on other banks. Level of convenience will be improved drastically as well. Certificates that are registered on blockchain network can be used by any bank. Inconvenient registration and log-in process will not be needed. One can easily go through personal verification through fingerprint, PIN, or pattern. Although financial companies are pushing to commercialize blockchain as various mediations, there are still tasks that they need to solve. Financial industries need to have responsive systems towards legal problems that can occur while they are using blockchain technologies. Regulations for consumer protection and prevention of money laundering are also needed to revive proper functions. Experts are emphasizing the need for revision of current Electronic Financial Transaction Act to popularize blockchain technologies for long-term. This is because current legal system was established for centralized computer system. For example, Electronic Financial Transaction Act’s Article 3 specifies ‘financial companies that have centralized computer systems’ as targets that are subjected to this Act. Appointment of CISO (Chief Information Security Office), procurement of safety, and analysis and evaluation of weak points of facilities based on electronic finance all have same problem. Responsive materials need to be examined as well whenever there are problems. Many lawsuits regarding virtual currency are prime examples. There is a need to fully consider possibilities of unknown problems occurring in the future. From today’s standpoint, we need to examine into various actions depending on who actually possesses blockchain network.